Not missing a beat, she said; “Bleu de Gex.” (Pronounced jhex.) I never really thought about it since it’s not a cheese that’s on many people’s radar – even in France. I’ve bought it a few times, mainly just because it’s fun to say the name, but it was an interesting choice for her to make and it never occurred to me to recommend that particular cheese* as the one to try. Bleu de Gex is made in the mountains of the Jura region of France, whose name became the root of the word Jurassic since rocks from this region were the first to be studied by scientists for clues to life during the Jurassic period. 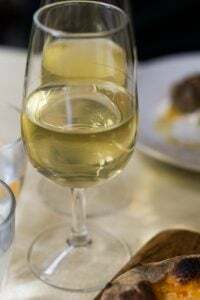 Nowadays the region is best known for Comté cheese, a pretty wonderful chocolate shop, the home of La vâche qui rit (Laughing Cow), and to a lesser extent, the wines, which complement the cheeses from the region very well. I was told that there are only four producers of Bleu de Gex (also called Bleu de Haut-Jura) in France; two are artisanal and two are industrial. 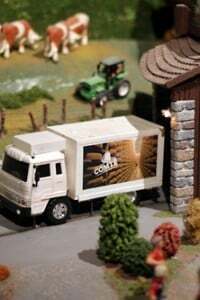 All the milk is fresh and raw, from cows that have been milked at nearby farms in the mountains that surround the cheese making facilities. In fact, it’s still warm and steaming when the farmers bring the milk to the fruitières early in the morning, where it’s to be made into cheese. 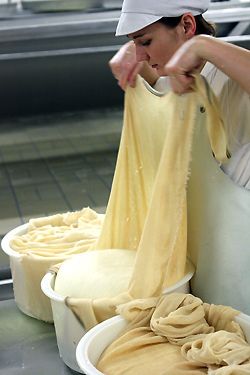 The first step is the caillage, when the culture is added to break the warmed milk up into soft, creamy curds. 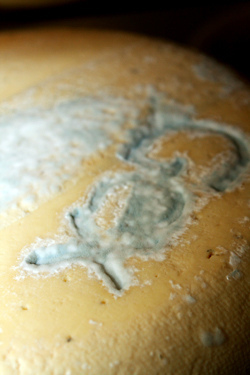 Mold spores are also introduced into the cheese, which give the finished wedges their characteristic blue veins. The cheese makers wake up very early in the morning and spend their early hours stirring the milk in enormous vats until the curdling starts. They also have amazing forearms, which would come in handy for me next time I have to push myself out of bed at such an early hour. 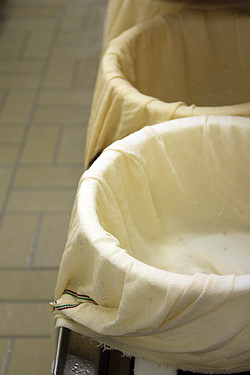 Once the milk has formed curds, they’re separated from the cloudy whey and the curds are heaped into cloth-lined round bins. 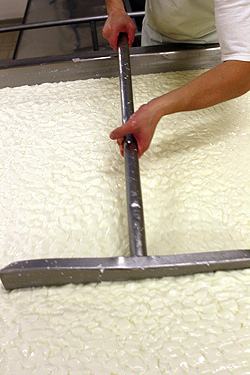 As the curds start settling in to the characteristic round shape of a wheel of cheese, they are flipped a few times to get as much of the liquid out as possible, and to compact the curds. 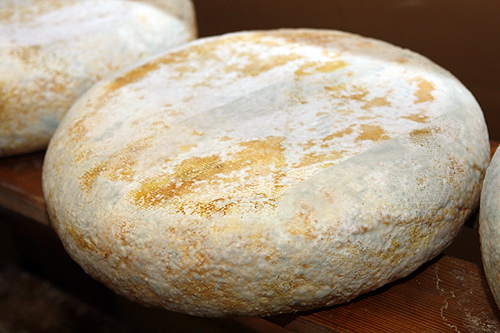 Once lightly pressed, the moist rounds are removed from their swaddling then the surface is salted and the cheeses are left in ripening caves for about three weeks. 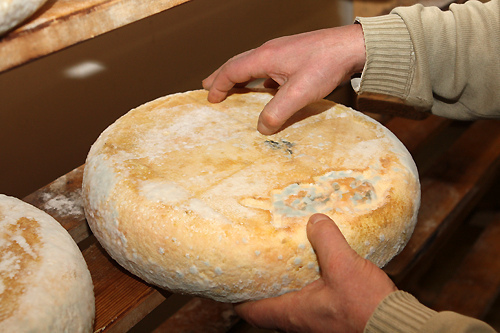 At the beginning of the ripening, the rounds are pierced with metal needles to facilitate the mold to grow correctly and create the blue veining. Some cheeses, like Roquefort, get split in half, from top to bottom, so they can verify the veins have made it all the way through the cheese; so it’s impossible to buy a whole round of Roquefort. 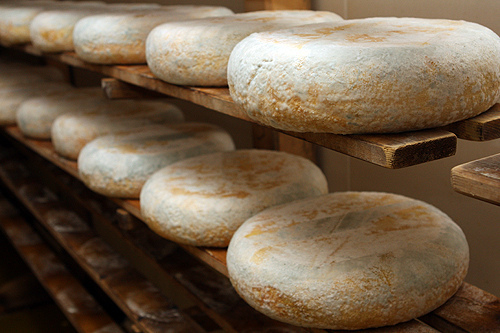 Each wheel of Bleu de Gex is stamped “Gex” because it’s a protected name, with an AOP designation, which ensures that the milk used is from the region and the cheese is produced according to standards. 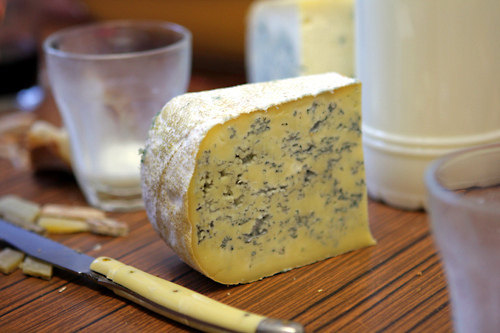 There are a good variety of blue cheeses in France and each tastes distinctly different, just like blue cheese elsewhere do, such as Cabrales from Spain, Maytag or Berkshire Blue from the United States, and Stilton from England. 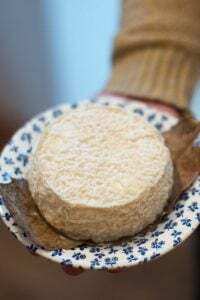 Roquefort, which is inoculated with moldy rye bread spores, is the most famous and most popular of the French blue-veined cheeses, but there are plenty of others worth checking out in France. 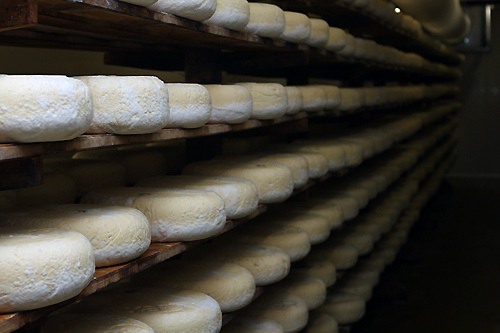 If you’ve never been in a cheese ripening cave, it’s quite an experience to be surrounded by cheeses at various stages of ripening. 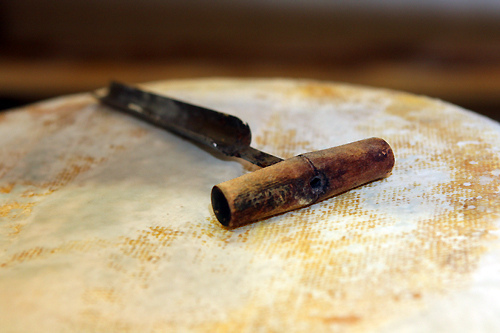 The smell, however, can be a little overpowering – even for the French, who are no strangers to strong-smelling cheeses. When I was in a Brie de Meaux ripening cave, a group of French women had to excuse themselves, holding their noses and racing toward the sortie. I don’t mind the smell as it clears my sinuses, right up through to the top of my skull. And I love being around all the cheese, even if I had to wake up at 4:30am to watch the fresh milk being curdled. I find the taste of Blue de Gex a little bitter and a bit acidic, mixed with a touch of buttery richness and a pleasant creaminess. The truth be told, there’s a little something about that acid flavor that I’m still on the fence about. Part of me likes the fact that the artisanal versions of this cheese retain the fresh flavor of the milk, since the cheese is sold so young. But the accompanying sharpness is not always all that agreeable. Interestingly, I’ve read that some people find it a mild cheese, which I suppose goes to show that people react differently to various cheeses and we all perceive flavors differently. Luckily there are plenty of different cheeses to please everyone. 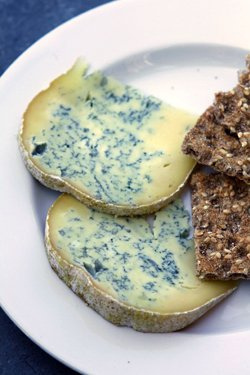 A popular dish in the Jura is made by melting slices of Bleu de Gex directly in a warm skillet, then sliding them onto bread or over a plate of hot boiled potatoes. When I buy it, I’ll make a blue cheese dressing, or crumble bits into a spinach salad and drizzle the leaves with hazelnut oil, then finish it with flakes of sea salt and some toasted hazelnuts. Or I’ll drop bits on top of hot noodles and let them melt, making little rich pockets of pasta sauce, providing a bit of tangy blue cheese in every bite. *I’ve been told that occasionally one can find Bleu de Gex in cheese shops outside of Europe, but it’s definitely not one that you’ll run across with any regularity. To find it, check with your local cheese shop or use How to Find Foods and Other Items Mentioned on the Site for a few tips. Great post David! I love that cheese too. There are obviously lots of great French bleu’s. I agree with you that Bleu de Gex is one of the most overlooked and in my opinion, under appreciated. I’m one of those that you referred to that thinks Bleu de Gex has a milder flavor compared to others of it’s kind. Love this one on a fresh baguette or in a salad. Oh how I do love me some blue cheese! And your friends shop The Cowgirl Creamery…AmAZING! Thought I had gone straight to heaven. I just had a friend in who lives near Lyon, she and her husband are German. I had her read “Sweet Life….” She loved it, laughed right out loud! She has many of the same opinions as you….it’s really a love hate relationship for her with these French people. I so want to try this right now! I love the idea of getting this bleu-de-gex in a skillet, getting it slightly melty and sliding it on some grand bread. Love the great vats of cheese. Thinking that if I was a cheesemonger I wouldn’t have to work out at the gym. MN and WI have some cave-ripening caves and they are just magical to me. Congratulations! Culinary Travel AND Professional on the Saveur web site. just the form and the surface texture is satisfying to my eyes. another reminder that eating is an activity that involves all the senses. can’t wait to taste this one. We are blessed to have Cowgirl Creamery here in the DC area. Their Red Hawk cheese is to die for. How lovely for you to get a chance to revisit your friendship with Peggy Smith who flat-out knows cheese. Oh, and congrats on the Saveur awards! I like that you honored her recommendation with a post even though it sounds like it’s not a cheese you love that much. I wonder what she likes about it so well, specifically. 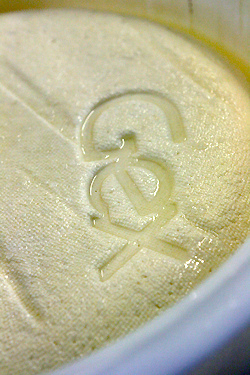 june2: It is an interesting cheese, but not in my Top 10 list (although taste is subjective..) and it was especially fascinating to see how it was made, which gives me a whole new appreciation of it. I love what these people do. i always learn sO MUCH! It’s a treat to have someone visit who likes food as much as you and doesn’t got catatonic when you start to talk food. I have a few friends like that myself. Oh David….please help me I am bleu, blue enamoured. This one sounds fascinating…must seek out. 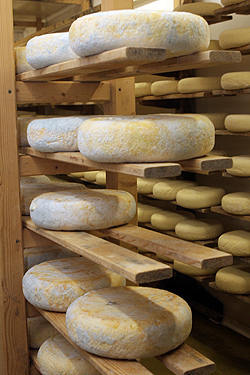 But so evocative…Cowgirl Creamery, Point Reyes, fog….love that place. Cabrales..well worth the drive to Asturias to the caves…if you love blue…British Blue..any of it I am in. My fave California cheese, Humboldt Fog, not a blue but so beautiful and exquisite in 3 layer profile. So glad I can get it here in Vancouver BC at Bosa Foods, although sometimes a bit over ripe. Bleu de Gex is also my favourite cheese. At one point I got a job close to Bourg en Bresse and that’s when I discovered it and I have been in love ever since. I’ve moved away from that region since then and it is quite difficult to get that cheese in Marseille but whenever I get the chance to buy some, I always do. It’s quite brilliant because it makes dinner so easy, just take some bread or some leftover cooked potatoes, put some Bleu de Gex on there and put in the microwave for a few seconds. Got that one from a lovely lady who had a tiny shop in the tiny village where I lived. I do have to say that your description of the smell and the acidity surprised me a bit, I’m like those others whom you’ve mentioned, for me it’s a very mild cheese. One of my local restaurants (I’m 20-odd km from Gex) has a salad with lettuce, tomatoes, hard-boiled eggs, potatoes and ham… topped with four “toasts au bleu de Gex”. My favourite… even if the bread they use is that horrid Harry’s “pain sandwich”. 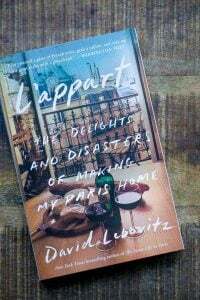 Congratulations David on winning best Saveur awards! But then we always knew you were the best anyway! Always nice to have confirmation all the same. 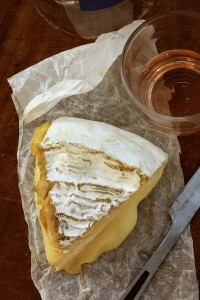 About cheese now, here in Provence, we just mainly eat goat’s cheese……..
Hi David, did you mean Cowgirl Creamery. ‘ Cowgirl Creamy’ seems to imply something a little different…. Wonderful article David. 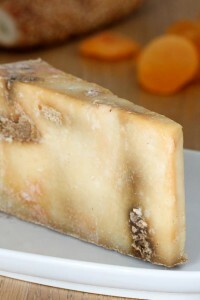 I had the opportunity to try this cheese last week as a friend brought some back from the Jura region. I agree with you on the flavour too. I tried some and it was an interesting taste but not my favourite type of cheese. Would love to see cheese made like this! There was quite a commotion at my cheese shop (La Fermette) when one time I said I wanted a bleu and suggested Roquefort as a possibility. Apparently that was a huge faux pas. “Madame!”, I was told sternly, “Roquefort is not a bleu. If you want bleu, there is bleu de Gex and bleu des Causses and bleu de Bresse. But Roquefort is Roquefort. It is not a bleu!” The fact that it’s blue didn’t make it bleu. To everyone’s relief, we agreed they were all persillés and honor was restored. My favorite among these is bleu des Causses, which is very similar to roquefort except it is cow’s milk whereas Roquefort is ewe’s milk. I surmise this is why Roquefort is not a bleu, since it is not made from cow’s milk. But I don’t dare ask the cheesemonger, for fear of risking our good relationship. David – thank you so much for this post. We will definitely try this cheese when we are in France in a few weeks. I really love and appreciate your perspective as an SF’er living in Paris. I enjoy seeing my local “celebrity” purveyors make cameos in your posts and hearing what they have to say! I’m not sure if you mentioned it, I’m almost sure not…but, what time did you have to get up to do something with your great pal that you wouldn’t have done if she’d not been enamored with Bleu de Gex? Anything bleu/blue in the cheese world commands my interest. Thanks for the posting! Great post…the cheese looks amazing! I always say one of the best parts of living in CA is being able to get Cowgirl Creamery cheeses so easily…cheers! This is yet another wonderfully evocative post that allows those of us not presently in France to have a window onto the experience. And a tie-in to Cowgirl Creamery to boot. What could be better! 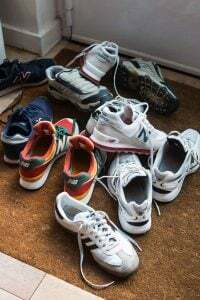 Unfortunately, I’ve been asked by my partner to refrain from buying it – and others – as the delightful (well, at least I think it’s delightful…my partner would beg to differ) scent permeates our refrigerator and he finds a hint of it in everything (which I admittedly can’t deny). I don’t leave any cheese in there for long, thanks to my rapid consumption, but I can’t figure out a way to keep it from “attacking” everything else in the fridge. David (and everyone), as I have a proclivity for “stinky” cheeses, have you any recommendations for storing cheese in such a way as to minimize its impact on the other refrigerated goods in my unit? Cowgirl Creamy? Don’t you mean Creamery? When is Bleu de Gex in season and could you recommend a few good cheese shops on the right bank? Just got back from Paris 2 weeks ago, toting both some bleu de gex and bleu d’auvergne. I prefer the bleu d’auvergne, which I can find here in LA, but they both seem to taste better having made the journey, stashed in my luggage. I like it tucked into a tart with cIppolini onions….oh, and a glass of Chablis. Love the step-by-step shots. Makes it easy to see how they do it. A good bleu is a good thing! 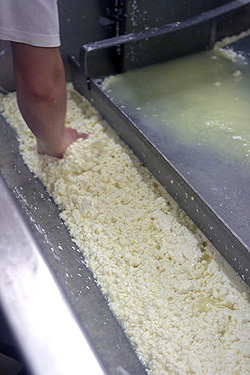 Loved this post, and the photos really give life to the cheese making process. Blue cheese is my absolute favorite and bleu de gex sounds so interesting. I would put it on grilled pizza with carmelized onions. David, what is on your top ten cheese list? And what are some of your favorite fromageries in Paris? Sari: I hesitate to do Top Ten lists because everyone has pretty different tastes in cheese but some favorite cheese shops in Paris include La Fermette on the rue Montorgeuil, Pascal Trotté, Quattrehomme, and the people who specialize in Brie de Meaux at the Bastille market, who (like Trotté) have amazing Comté, too. What an awesom experince,cheese is my favorite food. I live in Luxembourg, and after reading your blog entry I asked my friends if they had any ideas about finding this cheese in the Duchy. One friend suggested a local shop and–sure enough–they had it! Now I do, too. After tasting it, I think it begs for some ripe pears. As for stinky cheese smells, I bought a clear plastic cheese box a few years ago. Okay, it was at a Tchebo in Austria, but you can get the same result by storing your stinky cheeses in a large Tupperware container. It eliminates that “Oh, my God, there is a dead sneaker in the fridge!” moment when you open the fridge door. It is a great post, David. But I am not surprised; all of your posts posses a magnetic draw to read. After finishing to read it and reviewing the photographs multiple times, I feel as if I can start to make my own cheese. (And that is before I watched the video). Although, I am not sure I could tolerate the “wonderful aroma” that fills the cave. Another problem I would have in this case is that I do not like blue cheeses (most likely I am the only one in this planet). Unfortunately, I only like cheeses that I can prepare them as a filling for a great cheese danish. One of my favourite blue cheeses! Lucky for me, while it might not be available in the US, it is in Canada, or in Vancouver anyways, a but closer than France for some people. I think of it as a starter blue. I love your blog! I just started reading it. 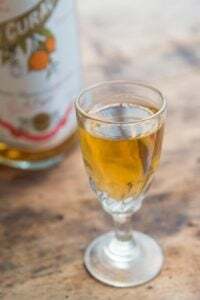 I am finishing up an 8-month stay in the southwest of France, between Toulouse and Pau, and reading your blog is a great way to celebrate the wonderful sejour that is about to end!! Have you ever been to this region? If not, you should definitely come for the Pyrenees, the cochon noir products, the duck confit that is EVERYWHERE, and the brebis. I just said goodbye to the weekly market in my city of Tarbes, where there is a cheese stand that attracts a long, winding line of brebis fanatics weekly. I’m so excited to use your recommendations in Paris next week! Lovely post and great photo’s, David. I need to be educated on blue cheeses, so they are high on my list to try next time I’m in your hemisphere. We bought it once on our way to Switzerland and we weren’t particularly impressed; but I think it’s one of the pleasures of having such a wide and varied choice in this country that some people go nuts over one cheese and others are being left cold but enthuse over another. I visited an Emmental Käserei (cheese cellar) when I was a teenager; it left me so sick and literally sickened, that for the next 10 years I couldn’t eat any Emmental cheese because I was nauseated every time I thought of it! Needless to say that with oneself approaching a more mature status in life, that ‘cheese sickness’ was cured and nowadays I buy my Swiss Emmental right here where I live and I love its slightly nutty flavour very much! An excellent article; thank you David. I went to Floriole’s on reading your blog and was so disappointed! The food was indescribably bland and there was absolutely nothing to write home about. So sad. You really need to trip to UK (that’s right UK) and Marks and Spencer and their wonderful fresh food and amazing desserts – seriously amazing they can run rings around restaurants like Florioles. It is so over-rated and over-priced. I’m so sorry but i’m from UK and i do compare these restaurants. I have also been to Paris and simply cannot see where you are coming from with this restaurant!! Even the salted caramels are BLAH! Try Thornton’s in the UK and especially their fudge and Special Toffee you will think you are in Nirvana – no more pretense please…………………. Please – let’s call a spade a spade!! why must you torment me with these amazing blue cheeses! i am pregnant for two months more and have to hold off. it’s just awful. these pictures are wonderful. I may be wrong, but I believe I have had Blue de Gex in the states–I remember being in need of some guidance on pronunciation–thanks for clearing that up, David. I’ll have to remember Jhex, not “gecks.” It’s been a few years now, but I recall it as a sharp, salty, ripe, rich blue that I enjoyed very much, possibly on a cheese plate in a restaurant. Of course, I haven’t met many blues that I haven’t liked. And I LOVE the smell of ripening cheese–bring on the funk, I say! Hi Holly: Thats often confusing for us anglophones, that in French, the ‘g’ is pronounced like our ‘j’ ! My comment is not for this post (and I apologize for that) but I do not see any “contact” button in your navigation bar? 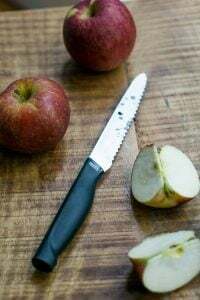 I just finished to read the article with the title: “Can Recipe Search Engines Make You a Better Cook?” in the New York Times and I wanted to second your comments about the drastic changes food bloggers experience since Google changed the rules. I am a newbie, so for me the change is non-existent, but for many of the “old timers” like you, this single move by the “King of Search Engines” appears to have created an unfair imbalance. I never understood the reason for taking someone else’s recipe and make it your own by omitting a semi colon. 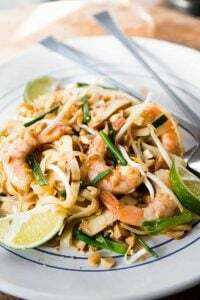 It brings into question the role of copyright rules; what is it the copyright protects if not the recipe, not the photographs and at times not even the personal stories attached to these recipes. I think that the community of food bloggers is large enough to bring attention to this and other associated issues that actually downgrading the quality of publications produced by its hard working members. This is a commenting page, so I must stop ranting here, but I just thought to start awaken the emotions of bloggers like yourself and encourage you to take actions, before it is too late. The reason I keep coming back to read your post is not because of what you write (although topic does have a role); it is the way you write about a topic. If we neglect to address this problem of disparity in its infancy, we are taking a chance to lose this type of communication that created this wonderful community of food bloggers. Georgette: the article actually quoted me for something I didn’t say- the number of people visiting my site has not decreased, but using the Google recipe search engine, my recipes don’t show up- mostly it’s aggregators and content farms that have taken the content, which a lot of other bloggers are finding. There is a good discussion on http://www.food52.com about it with a response from someone at Google, and I added my thoughts there in much more detail. You can also leave a comment in Google’s forum on the topic. I actually found Bleu de Gex to be quite mild, which isn’t a bad thing, but it usually meant that Roquefort found its way into my pannier more often than the Gex. And the very mention of Comte (which I have, as yet, been unable to find in the US in its more aged state–26 months seems about right to me) made me drool on my keyboard a little. Thanks for talking about cheese. It’s an eternally fascinating subject. 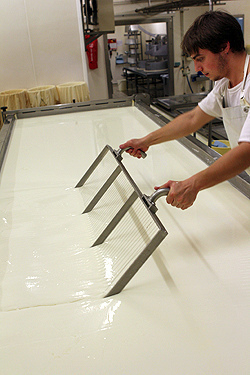 Hi David – We took a weeklong cheesemaking course at Cal Poly San Luis Obispo a few years back. It was a terrific way to spend a week, the we went wine tasting in the Paso Robles area that weekend. 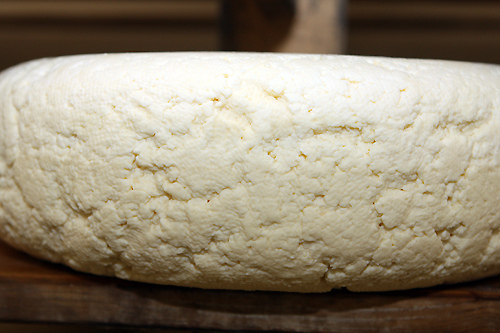 Really enjoyed your photographs of the cheesemaking process. Thanks so much for all you do. I’m only able to get to France once a year or so and I relish living vicariously through your site. I particularly love this post. Bleu is my favorite and I’m going to Montreal this week so I’ll stop in at my favorite cheese shop in Jean Talon marche to find Gex. David, which of the regular supermarché brands of blue cheeses in Paris do you recommend? I’m trying to find the best (cheap) blue cheese that can be bought from Franprix but there is quite a selection – thanks heaps. Hi Danielle: It depends what I am doing with it. For dressings and salads, I’ll often buy a Bleu d’Auvergne or Forme d’Ambert, but for eating, I’ll buy Roquefort, which is the most expensive but tastes a lot better. Just an aside about the perils of keeping smelly cheese in the fridge. In short, you don’t have to. I stopped using the fridge when I heard an English cheesemaker say that cold storage is not only unnecessary but it spoils the flavour and its natural development. I’ve found this to be true and the cheese is also always ready to eat, not needing time to come to room temperature. I keep the mouldy cheeses and non-mouldy in separate lidded plastic containers with a paper/wooden/card layer to prevent contact with the plastic base (this may be unnessary). Having no cellar (unusual for French country houses), the cheese is stored in the coolest corner of the house, on the floor under the stairs.